Do you consider yourself a data law-abider or a rebellious rule-breaker? Chances are, you are somewhere in between, and this is good. For the most part, rules are there to be broken, and we should follow our own moral compass when creating visualizations. Of course, the data we offer up must be accurate first and foremost, it must be clear also, and well-presented so that our users can quickly and easily draw a conclusion. To help us to achieve all of this, there are some guidelines and rules we can follow. These are some of the basic principles which data visualizers must adhere to when they create their visuals… or at least most of the time. Consider this trio of regulations as a handy guide to help to keep you on the right lines, but don’t worry about moving the goalposts a little if the situation calls for it. A data overload is a dangerous thing. Often, content producers eager to hit users with the full weight of the figures will splash hundreds of different data points across a page, each one a valid figure with plenty of insight to be drawn from it, but each drowned out by the sheer weight of information on show. 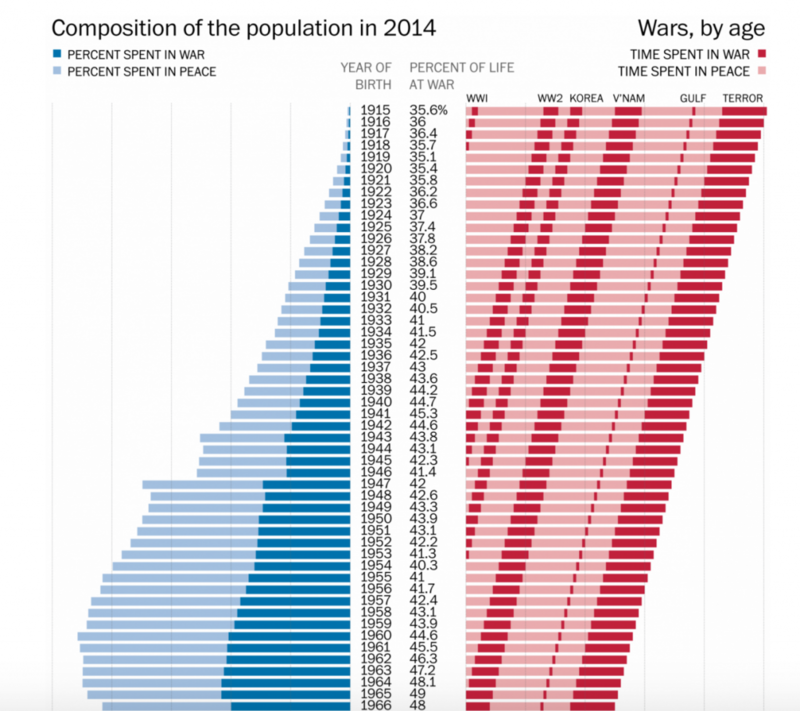 Good quality data visualization should be an exercise in concision. What are you trying to say? Which figures best represent this? This will tell you what data you need. Of course, it doesn’t always have to be this way. How can this rule be subverted? In a word: interactivity. Information overload only really applies when all the data is shoehorned into one, relatively small space. Interactivity gives us the opportunity to express vast amounts of data, in various configurations, without frazzling the user’s synapses. Just like a neat and tidy filing cabinet is easier on the eye than a ton of papers strewn about a desk, structured data is far better than an explosion of facts and figures. Give your users an engaging data narrative to explore. When data becomes unwieldy, it is just annoying; annoying for the visualizer, annoying for the writer of the accompanying text, and annoying for the user who has to read the whole mess. With this is in mind, try to keep to a manageable scale with your visualizations. Don’t go nuts and create huge, difficult to fathom visualizations in an effort to cram more data in. The user simply is not going to buy and will instead be thoroughly turned off. Again, a considered approach is necessary here. What are you aims and objectives with the visualization? What do you want the user’s take-away to be? This should be represented not only by the data you use, but also by the space in which you present it. With this one, it is not so much ‘how’ to subvert as ‘when’. Obviously, using a vast infographic that requires the user to scroll down or across their page is going to be somewhat irritating, but sometimes you can use this to your advantage. When the time comes to really play with scale – for example, when you want to illustrate the sheer size of one value compared to another – it is time to subvert this rule. Think about the stunning visual that the Washington Post used to represent the position of the Flight MH-370 flight recorderon the ocean floor, or other visuals in which scale is paramount. This is how to break the rules with aplomb. The usually impressive Gallup made something of an error in 2012 when it constructed a data visualization for its poll on sexual orientation. 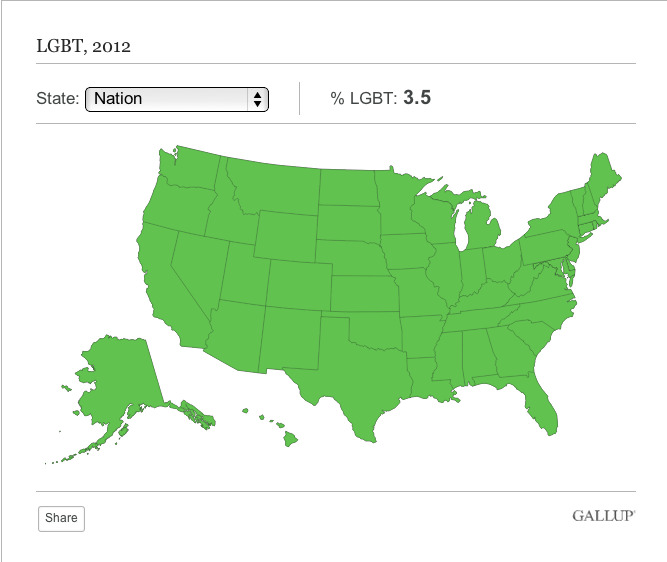 It opted to represent the data on a state-by-state basis, with states with the lowest percentages of LGBT residents coloured green. Unfortunately, although there were significant disparities between states – 1.7% of North Dakota’s population is LGBT, compared to 5.1% of Hawaii’s, for example – all the numbers were low enough to color the map a very similar shade of green. This, unfortunately, tells us very little about the data. To make striking visuals, you need striking colors. Introducing contrast is a simple way to draw attention to different components of a data set. However, sometimes we want to show a progression, an incremental narrative shift to connect two different data points. In these cases, we don’t necessarily need to go for a big contrast, a subtle gradation in color can be more effective. This comes back once again to the importance of the data itself. Let the ‘Golden Rules’ guide you, by all means, but questions surrounding the data and the best way to present it should be the driving forces behind your visualization. Of course, there are some lines you just can’t cross. Before this whole article descends into anarchy, it must be stressed that some rules of data visualization can’t be broken, subverted or even meddled with just a little. These are the sacred tenets… please show them the reverence they deserve. How many times did your elementary school English teacher tell you that a story needs a beginning, a middle and an end? Well the same is true with the narratives we create from our data. Creating visuals – charts in particular – without displaying all of the relevant scale and detail is simply misleading. Don’t do it. An axis on a chart must always begin at zero; a timeline should provide all the relevant contextual data, and not just zoom in on a highly specific time period. If your visuals are going to be reliable, and if they are going to tell the whole story, you need to make sure that this is the case every single time. We’ve touched on this before, but it is worth mentioning again. We are working in the field of data visualization, not data imagination. The data must come first; we must tell its story in the most fitting way we can. If your team is approaching the data with a flashy chart or piece of visualization already in mind, or if you are already forming an agenda before a thorough examination of the figures, you need to stop and take a deep breath. Let the data lead you and inform your visuals. How to Subvert? Don’t even think about it. Previous articleAre You A Storymaker Or A Storyteller?